Powered by the industry leading DYNAMIXEL line of robotic servos Interbotix offers a wide variety of robotic arm platforms to suit many different applications. At the core of each of the Interbotix robot arms lies the Arbotix-M Robocontroller, an AVR / Arduino compatible microcontroller designed as an advanced control solution for AX/MX/RX/EX DYNAMIXEL servos and Bioloid based robots. Each of the Interbotix robotic arms is constructed from 5052 brushed aluminum brackets and sturdy Delrin / acrylic material and come with the lightweight and powerful Phantomx Parallel AX-12A gripper. The onboard Arbotix Robocontroller can be programmed using the Arduino IDE or custom firmware, providing 8 digital and analog IOs, Xbee wireless or USB connectivity, and a powerful ATMega644p capable of handling Inverse Kinematics code onboard. 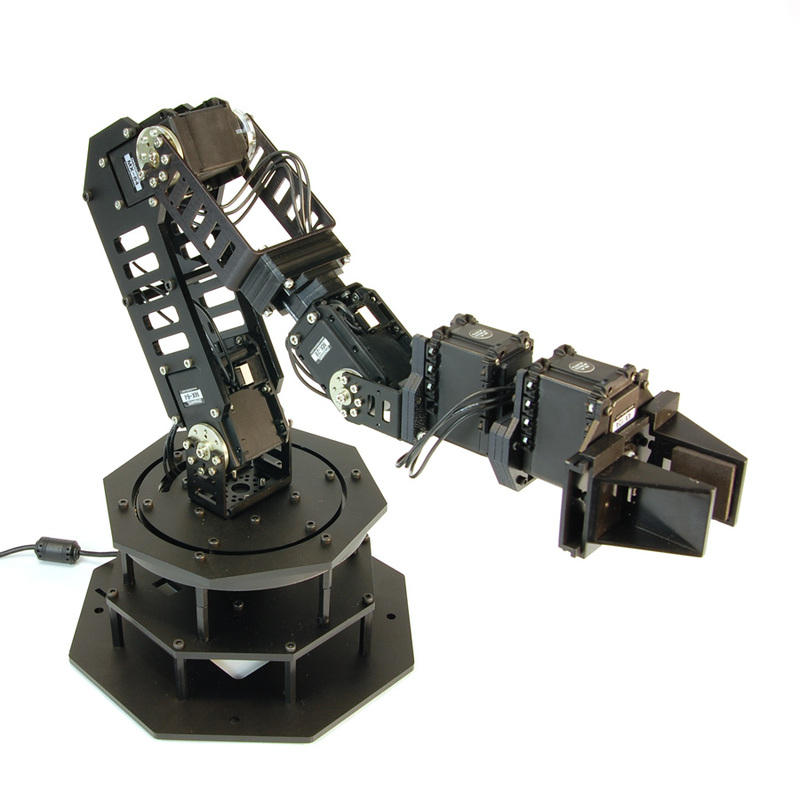 The PhantomX Pincher AX-12 Robot Arm is a 4 degree-of-freedom robotic arm and an easy addition to the TurtleBot ROS robot platform. This hardware kit comes with everything needed to physically assemble and mount the arm as a standalone unit or as an addition to your Turtlebot Robot/mobile platform. The PhantomX Reactor Robot Arm AX-12 Robot arm is a 4 degree-of-freedom robot arm and a step up from the Pincher in terms of size and strength. 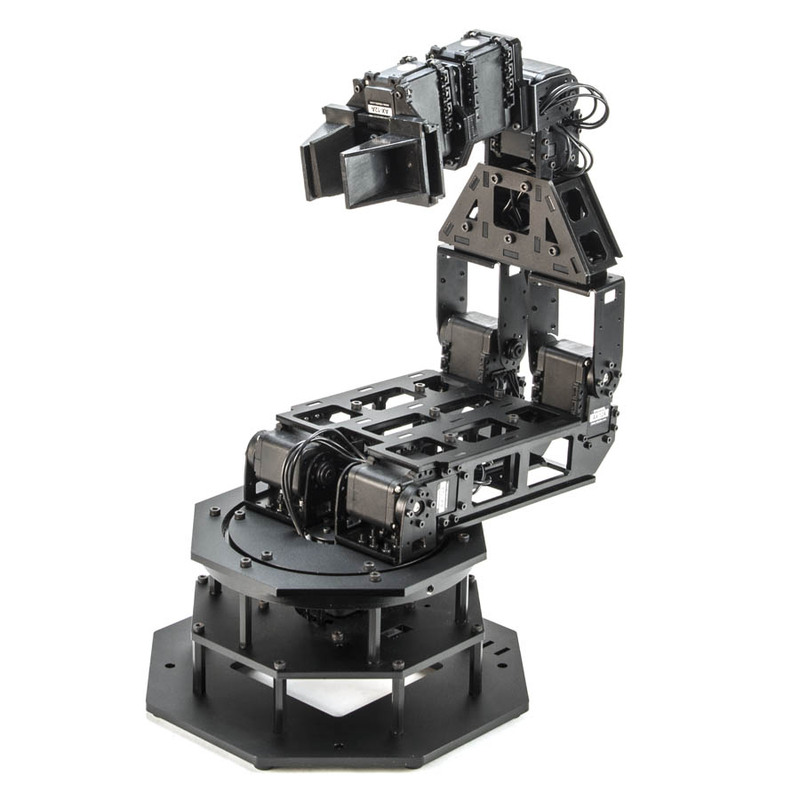 The PhantomX Reactor Robot Arm was designed with entry-level research and university use in mind providing one of the highest featured arms on the market today while not breaking one’s budget. A rugged Delrin boxed frame design and 14cm diameter ball bearing rotational base ensures maximum rigidity and accuracy. Optional wrist rotate allows for up to 5 degrees of freedom, along with a custom designed parallel gripper for high precision and maximum gripping strength.The Reactor Robot Arm has up to a 43cm horizontal reach and 55cm of vertical reach. At a 10cm reach it can lift up to 600g, and at 30 cm up to 200g. The gripper itself has a rated holding strength of up to 500g, while the wrist itself can lift up to 250g horizontally. (150g if using wrist rotate). The WidowX Robot Arm Mark II is the update to Interbotix Labs’ entry level arm offering for the MX series of DYNAMIXEL Servos. The Mark II has a few improvements that we’ve made based upon our own testing as well as customer feedback. We’ve upgraded the elbow servo from an MX-28 to an MX- 64 complete with custom aluminum brackets for added frame strength, replaced the Arbotix with the new Arbotix-M, and streamlined the arm structure to be lighter, simpler, and stronger. The MX series actuators provide a full 360 degree freedom of movement in the base, ultra-high resolution of 4096 positions, user-definable PID parameters, and extremely smooth interpolation. The hefty MX-64 shoulder & elbow servos gives the WidowX very strong lifting strength in a slim frame. If you are looking for medium lifting strength and desire smooth control, high accuracy and repeatability the WidowX is a great mid-level arm choice. MX DYNAMIXELs support up to 360 degrees of motion, which results in an extraordinary range of motion and reach on the WidowX . Temperature monitoring, positional feedback, as well as voltage levels, load, and compliance settings are user accessible as well.